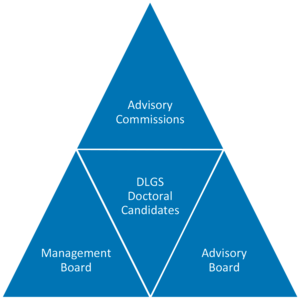 The DLGS has a simple management structure with a flat hierarchy providing for inter-institutional and interdisciplinary collaboration. The organisational structure comprises a Management Board, an Advisory Board and an Advisory Commissions. The Management Board is the executive body of DLGS. It is in charge of developing and implementing strategies, plans and policies, as well as managing the DLGS. It comprises the Executive Director of IOER and four members from TUD and IOER. The Advisory Board includes professors from European universities and outstanding related professionals. It supports the work of the Management Board and provides advice on strategic orientation and the incorporation of basic research issues. Members of the Board may be involved in DLGS curricula activities as external experts. The Advisory Commission is established for each Doctoral Candidate on an individual basis. It has the function to guide and monitore the doctoral work. Richard Lorch, Editor of the journal "Building Research & Information"